Video McDonald's Employees Run Off When Pharrell Tries Dancing Singing To Get Them To Open Up Early In Paris! We think the chart-topping singer-producer has found his next number one! There's no denying that Pharrell Williams is a man of many talents, especially when it comes to music. As the man behind pop's biggest hits it comes as little surprise that he can make a song and dance out of just about anything. However, the singer-producer had staff at McDonalds a little more than confused when he spontaneously burst into a bizarre musical number whilst ordering his food. 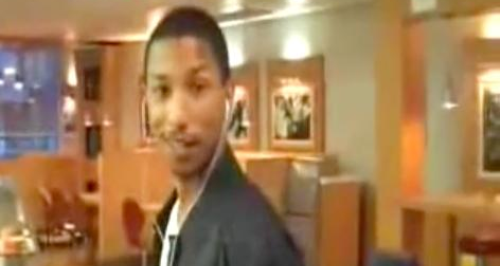 In a hilarious clip that's surfaced on the web, Pharrell is seen complaining to cashiers at a Paris branch of the fast food chain that he could miss his flight if his order doesn't arrive in time. In a bid to hurry the staff along, the 'Happy' hitmaker bursts into song and dance as he reels off his enormous order like it was one of his very own catchy pop tunes. Unfortunately for Pharrell, the staff at the counter did;t seem too impressed with his musical efforts as they looked at him bemused whilst one notably continued to stir her tea without batting an eyelid. Oh you've got to give Pharrell an A for effort. Oh and something tells us he's onto a winner with that song!